In the course of three years Sylphide has reduced her waist to the respectable smallness of 17"; she knows many of the delights and sorrows that corseting women experience or have to endure. She will deal with all questions concerning corsets, lacing methods, health, fashion and how-to's on the way to a small waist. Please note: This picture has not yet been published anywhere. Our copyright conditions apply especially to it. Please read and respect them. Unfortunately we had to insert identifications into the pictures because there were re-publications of them in the web (which we cannot allow) without a specification of the image source (even more bad!). There may even be people who make a claim for an own copyright on these pictures. Therefore we ask for your understanding concerning the steps we have taken. Please work together with us for the aim that such steps are not necessary anymore! 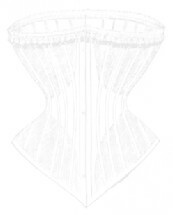 The waistlines are the outside measurement over the tightly laced corset. Please note that the pictures are totally authentic and in no way retouched (except for some anonymizing). In the picture you see Sylphides newest, longest and tightest corset. It is from TCG and laced to a waistline of 17". It covers the bust, therefore Sylphide doesn't need a bra here. This is especially useful with light summer dresses or evening dresses which don't cover the shoulders. Believe it or not, there is no retouching as with all other pictures in this site! Sylphide says: I'm currently wearing this corset continously. That means, that I put it off only each 24h for taking a shower and to do fitness-exercises and stretching. I then put it on immediately. The first half hour is somewhat uncomfortable, but after it, especially after the first night, I hardly feel the corset anymore (only when bending or doing unusual movements). It is a very pleasant feeling to wake up laced into the corset, because I do know, that it needs not to be laced tighter. This would be necessary if I would put on the corset each morning. Please note that the corset does not interfere with my sleep! Furthermore I think it is important that one eats and drinks only when laced into a corset. This prevents overeating and one feels comfortable after the meal. 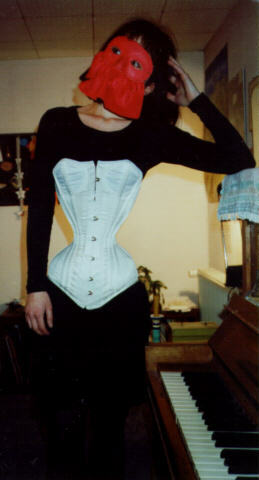 This would not be the case if one ate uncorsetted and put on the corset afterwards (even some hours later). Since the relaunch at 26-Jul-2005 there were 4624612 clicks on the whole website and the actual page was accessed 76199 times.